With Group D leading off today’s games, It’s worth reviewing Costa Rica’s defeat of Italy in anticipation of Italy – Uruguay, a game to decide which team will join Costa Rica in advancing. Though a stunning win for the Ticos, the game offered more tactical interest than open excitement. When compared to the England game, Costa Rica’s performance gives a good sense of how to beat Italy–aside from playing them while they are still recovering from a game in Manuas, a site that has seen all of its participants lose their following matches. This is a bad precident for a US team that needs a result against Germany or a Portuguese victory against Ghana following their non-stop tilt in the jungle. But that’s an issue for a US – Portugal precap. Let’s look at the Italians’ undoing. Costa Rica used the same 5-4-1 that had defeated Uruguay, but central midfielders Celso Borges and Yeltsin Tejeda swapped positions in order to allow Borges to focus on marking Pirlo. It’s worth noting that the teams in this World Cup that are employing three at the back (Costa Rica, Chile, Mexico, and–less consistently–the Netherlands) are doing so in connection to a strategy of consistent pressing rather than in response to their opponents’ deployment of forwards. As predicted, Prandelli brought back the iconic Gianluigi Buffon in goal and moved Matteo Darmian to left back, probably as much to replace Gabriel Paletta as to bring in Ignazio Abate on the right. Andrea Pirlo remained in a high midfield position in Italy’s 4-3-3. In the second half, his team shifted into a 4-4-1-1 with the replacement of Thiago Motta by Antonio Cassano, a shift that was furthered by the later introduction of more conventional wingers in the form of Lorenzo Insigne and Alessio Cerci. All of this is likely irrelevant for the Uruguay game, however, as reports suggest Prandelli will return to the 3-5-2 system employed by Juventus–and by Prandelli, at the start of Euro 2012. This will mean that a lot of personnel changes: Bonucci will come in as the central center-back, and left wing-back Mattia De Sciglio is set to return from a thigh injury. With Daniele De Rossi injured, Andrea Pirlo will likely partner with Marco Verrati and either Thiago Motta or Juventus teammate Claudio Marchisio in the midfield. Meanwhile, Ciro Immobile is expected to start up top alongside Mario Balotelli. Andrea Pirlo (Ita) – Many commentators noted the marked difference in Pirlo’s performances against England and Costa Rica, which was definitely down to the marking of Borges but also greatly facilitated by his more exposed position higher on the pitch (as I suggested would be the case). It’s worth noting that Pirlo’s passing was most notably stifled in the first half, before he permanently shifted to a deeper role alongside De Rossi. In addition, Pirlo’s only really dangerous passes in the first half came when he retreated back into his own half to find space, usually also moving to the right to further escape Borges. These efforts produced balls over the top for Balotelli at 31′ and 33′ (the latter headed on by Thiago Motta), and he had another similar delivery at 27′ created by moving to the left touchline (the “failed” pass that nonetheless created a shooting chance for Motta). Shifting back to a 3-5-2 should give Pirlo more space to work, especially if he resumes his more conventional deep-lying role. This is particularly good given that Uruguay has a midfield full of destroyers, most consistently Egidio Arevalo, that would be happy to mark Pirlo out of the game given any chance. This will leave the back three exposed against two of the finest strikers in the world, of course, but it is a back three used to playing together and highly effective. Antonio Cassano (Ita) – Cassano’s performance all but ensured that he will not feature in the rest of Italy’s tournament. 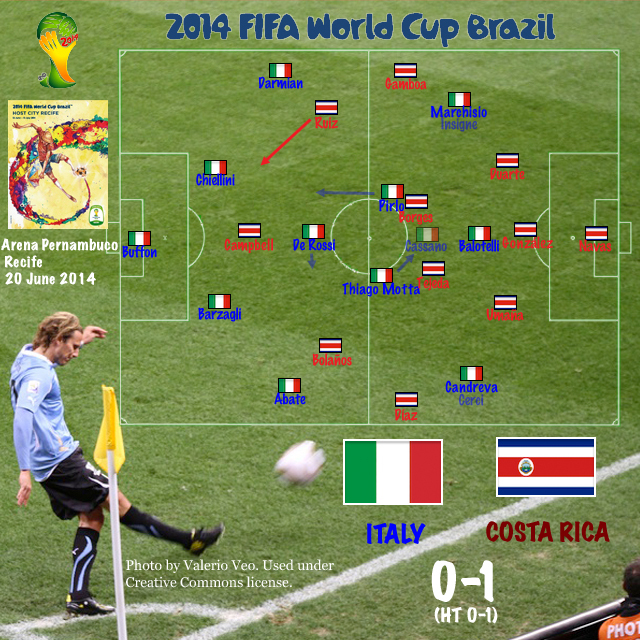 The change allowed Italy to challenge Costa Rica before they entered Italy’s half, and in theory Cassano’s position between the lines made good attacking sense as well, forcing Costa Rica to choose between dropping one of their midfielders deeper to cover him or pushing a defender, usually Óscar Duarte, forward. In practice, however, his link-up play was deplorable, and Italy was actually less threatening than in the first half despite Pirlo’s more effective passing. Cassano can’t be blamed for the failure of the wingers to change things, but he looked a shadow of his Euro 2012 self and is surely the reason for Ciro Immobile’s chance at a starting spot.